ClearFresh EcoSmart Down Alternative Pillows are a premium addition to the bedtime comfort of anyone that uses them. They're thrifty, quality, and comfortable. More affordable than their down pillow counterparts, users are sure to be satisfied with them for a plethora of reasons. First and foremost, these pillows are treated with an antimicrobial barrier. This prevents nasty little microorganisms from making a home on the surface of the pillow. The ClearFresh barrier gives permanent protection from mold, mildew, yeast, bacteria, and algae. It allows them to remain hygienic and neat for the duration of their life. EcoSmart technology makes it so the pillows can be revived and refreshed during the wash cycle and won't break down, unlike regular down pillows. ClearFresh EcoSmart Down Alternative Pillows have been tested and maintain their optimum structure for a minimum of 50 wash cycles. This includes drying them. As a result, customers need not remove the pillow with any trepidation about ruining the integrity of the product. The pillow also boasts a 233 thread count, so even excluding a pillow case, they're soft to the touch and cozy. Not wanting to skimp on the value of the ClearFresh EcoSmart, the company also ensured that the outer casing is 100% cotton which is the least irritating to the majority of skin types. They are available in a the complete spectrum of sizes: standard size (20" x 26"), queen size (20" x 30"), and king size (20" x 36"). For customers that want the most features, for the best value, without squandering their money on products that are prone to break down, the ClearFresh is a great investment. The varied sizes and reflective elements give those buying or using them peace of mind. Peace of mind that they are using a product of the finest quality. Looking for Wholesale 8 Piece Non-Stick Aluminum Cookware. Non-stick cookware can be advantageous for an abundance of significant and pertinent reasons. Professionals who work in kitchens day in and day out are usually aware of this. Non-stick cookware can bring a range of different benefits to the table. It can contribute to dishes that don't have any oil whatsoever. People who like the idea of keeping oil out of their kitchens as much as possible, as a result, may appreciate this. Non-stick cookware doesn't have complicated or time-consuming maintenance requirements in any way. This cookware is a cinch to wash and clean thoroughly. Drying it properly isn't a big deal, either. Non-stick cookware tends to be attractive, visually appealing and contemporary in style. It never looks outdated or boring. It isn't susceptible to scratching. That's a significant benefit for people who want to keep their cookware items pristine and flawless. This type of cookware also offers the convenience of heat distribution that's nice and even at all times. Culinary professionals who want to be able to prepare their food efficiently can benefit from that. Efficient cooking can also help minimize gas costs. There are many wonderful options in non-stick aluminum cookware products on the market these days. If a restaurant owner wants to invest in a pan that won't trap eggs during the cooking process, he can enjoy a wealth of convenient and useful options. There are many sturdy and resilient non-stick cookware sets available for purchase on the Internet. These cookware sets frequently consist of eight distinct pieces. People who want to buy non-stick cookware sets that are particularly tough and powerful should go for heavy gauge aluminum. It can also be a good idea to go for aluminum that is topped with Whitford Xylan. This coating can be perfect for smooth and dependable nonstick finishes. Aluminum cookware sets typically are made up of fry pans, Dutch ovens, and saucepans. There are many affordable aluminum cookware sets on the Internet. These often even come with shipping that's 100 percent free. Shower curtains come in all styles nowadays. They all offer their benefits, too. People who are looking for shower curtains that are particularly sturdy and resilient don't have to agonize. That's because many shower curtains are made using fabric that's notably heavyweight. These varieties of shower curtains can come in handy for showers that get a lot of use. People who are looking to purchase shower curtains that are suitable for dormitories, hotels, hostels, inns and other settings can often benefit from heavyweight fabric use. Heavyweight fabric shower curtains give users the advantage of strength and reliability. That's not where their benefits end, though. That's because they're frequently available in a wide range of lovely and exciting styles. People who purchase these shower curtains don't have to sacrifice aesthetics in any way. They're often available in pleasing yet muted and subtle colors such as white, taupe and gray. They frequently have gorgeous waffle weave patterns, too. People who want to invest in shower curtains that blend strength with exciting design can explore so many high-quality choices nowadays. These curtains can be timeless. They're made in solid colors that are elegant and understated. They're often densely woven as well. People who want to avoid shower curtains that are flimsy can get behind them. It's important to purchase shower curtains that can remain in tiptop condition for a long time. It can cost a substantial amount of money to replace shower curtains. When businesses have to replace shower curtains, they have to purchase many new ones at the same time. That can be pretty overwhelming. It's critical to buy shower curtains that can remain in A+ shape even after multiple items of washing. Business owners who want to tour seemingly countless choices in heavyweight fabric shower curtains can do so on the Internet. The Internet is home to a vast selection of retailers that stock wholesale heavyweight fabric shower curtains. These curtains are often inexpensive, too. Window shower curtains for stalls can be convenient for businesses of all types. They're often seen in hospitality environments. A business owner who runs a bed and breakfast that has shared bathrooms for guests may want to invest in window shower curtains. These kinds of shower curtains are convenient for some good reasons. They give people who are showering plenty of privacy, first and foremost. Although they offer ample privacy, they also bring in light. It can be challenging and uncomfortable to shower inside of stalls that are excessively dark. The right window shower curtains, however, can solve that dilemma easily and quickly. Window shower curtains that are seen in hotels, bed and breakfasts, hostels, inns and educational institutions need to offer privacy benefits. They also need to offer strength. That's because so many people have to depend on them day in and day out. Business owners want to steer clear of window shower curtains that are prone to problems, and that may not stand the test of time. Frequent shower curtain replacement costs can add up rapidly. Mildew can be a big problem for window shower curtains, too. This is due to moisture. Businesses that want to buy window shower curtains that aren't vulnerable to annoying mildew can look for options that are equipped with anti-mildew treatment. Metal grommets are often features that are part of window shower curtains. They provide hook holes with extra power. This power can prevent tearing if someone tugs on the curtain. Business owners frequently have to buy window shower curtains in bulk. The Internet, however, makes it easy to buy large numbers of window shower curtains at the same time. 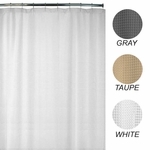 There are quite a few reputable online retailers that sell wholesale window shower curtains to the public. People can often purchase them in sets of 12 total. Complimentary shipping is also often available to purchasers. These curtains frequently come in ivory and white.